When American Pharoah enters the starting gate for Saturday's Belmont Stakes, it will mark the 13th time since Affirmed's heart-stopping win over Alydar in 1978 that a 3yo will stand in that spot with a chance to become the 12th horse to win racing's Triple Crown (a 14th, I'll Have Another, failed to make the race). Contrary to popular belief, a victory by American Pharoah will not instantly cure all that ails this great game. Nor will it instantly turn the 90,000 or so in attendance into habitual attendees at racetracks far and wide. 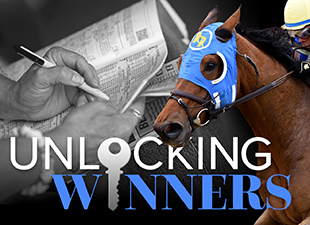 A win, while marking the completion of a great achievement, will not even stamp American Pharoah as a great horse. That's not to say he may not be great. He still has every chance to prove himself great, and a win in the Belmont Stakes would be a very long step on that journey, but that stuff is determined over time. It is not determined by one race (or three races). Fans that we are of this great game, we are never that far away from falling into the added excitement and hype surrounding the chance to see that next Triple Crown winner. We have no doubt that we will, in fact, see him or her, whoever it turns out to be, at some point. That the series is hard to win, and that so many have tried and failed since 1978, is as it should be. Run down the list of past winners of all three legs of the Triple Crown, and remember what they accomplished both before and after the series, to remind yourself, if necessary, of what greatness truly looks like. Regardless of whether American Pharoah ultimately proves himself to be great, he is standing on the precipice of a memorable achievement, and all that stands in his way is one long lap around Belmont Park's massive main track and seven rivals. #1 is Mubtaahij (10/1). Conditioned by one of the great trainers in the world, Mubtaahij came to the states with plenty of gloss on him after winning five of his first six career starts on dirt in Dubai. He saved his best for last over there, stalking and then inhaling his rivals in the $2 million UAE Derby en route to a visually appealing 8-length win. Trained by a master or not, visually appealing wins or not, he was still a little slow coming into the Derby, and this horse was found out in that race. His trip was a good one, but Mubtaahij never had enough while racing on his wrong lead all the way through the stretch (something of a habit of his), and he was no factor while finishing a distant 8th. If you want the positive view, that race came just 5 weeks after the UAE Derby and a ship halfway across the world, and he has now had a further 5 weeks to get ready for the Belmont Stakes. He would not be the first young horse of some talent to improve with the simple addition of time. But he had better improve and improve a lot. #2 is Tale of Verve (15/1). His trainer had begun to build a reputation for running 2nd with longshots in Triple Crown races (Commanding Curve 2nd in the Derby at 37/1; Golden Soul 2nd in the Derby at 34/1; Macho Again 2nd in the Preakness at 39/1), and he did it again three weeks ago in Baltimore, as Tale of Verve picked up the shattered pieces behind American Pharoah to finish, yes, 2nd, at 28/1 odds. That was a career-best performance from this horse, and it earned a 111 TimeformUS Speed Figure, but it was also, more than anything else, opportunistic. He's a big price once again on Saturday, so we will not knock him, but we will not be using him, either. #3 is Madefromlucky (12/1). Privately purchased and turned over to Pletcher following a maiden win at the end of his 2yo year, he has since posted a pair of wins around a pair of dustings by American Pharoah at Oaklawn Park. His Peter Pan win last time is the best race he has ever run from any perspective (113 TFUS Speed Figure), and he delivered the kind of grinding run through the stretch of that race that would indicate that staying the 12 furlongs in front of him on Saturday is within the realm. 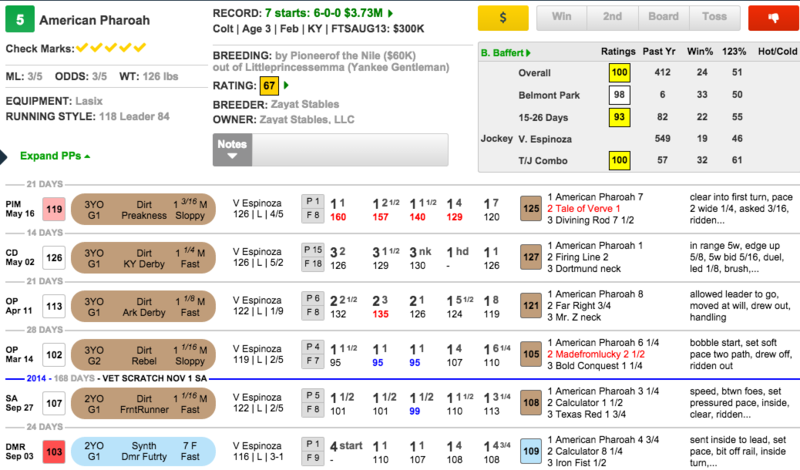 He is still in the position of having to step in vs. some much better horses here, but distance is always the great equalizer in this game, and this horse may see it out as well as anyone. #4 is Frammento (30/1). Nick Zito has been known to spoil a Triple Crown bid, or two, in the past, so Frammento has that going for him, at least. (Zito-trained horses knocked off both Smarty Jones--Birdstone--and Big Brown--D' Tara--in the Belmont Stakes as they tried for the Triple Crown in 2004 and 2008, respectively). Birdstone was a very good horse who never really got his due, but Frammento would be at least as surprising a winner as D' Tara was. He has improved his TFUS Speed Figures for each of his last three starts (99-102-111), and he did finish up well from off the pace when 3rd in the Fountain of Youth back in February, but there really isn't much to hold on to here. #5 is American Pharoah (3/5). Most are well-versed by now on American Pharoah's credentials. Undefeated in six starts since shedding blinkers out of an educational debut, he has managed to inspire awe from on-lookers everywhere, both in the morning and in the afternoon. He has won 5 Grade 1s, including, of course, the Kentucky Derby and the Preakness, and he has already defeated every one of his Belmont rivals at least once. He is the fastest 3yo coming into the Belmont Stakes, having earned TimeformUS Speed Figures of 127 and 125 in the first two legs of the Triple Crown. American Pharoah has only ever had to dig really deep once during this current winning streak. That was in the Kentucky Derby, where he threw it down with Firing Line through the stretch before prevailing by one full length at the end of that mile and 1/4 test. His Preakness run came on the heels of a powerful rain storm, which turned the Pimlico track sloppy and gave the wet-loving American Pharoah a huge edge on his competition. He has been given extra credit in some quarters for going a fast early pace over that sloppy track, but to us, that quick run to the first turn is what won the race for him. Once he was able to run his main competition out of the race (with an assist from a track condition that they seem not to have cared for), and come to hand to catch a mid-race breather, all he had left to do was hold off the likes of the slow plodder Tale of Verve late. Because of the conditions the Preakness was contested over, we have to go back to Kentucky to take our line on this horse. And on that evidence, American Pharoah may well be better than his contemporaries, but the margin of his superiority is not overwhelming. American Pharoah's most potent weapon comes into play as soon as the gate opens. He is faster than his opponents, and he is expected to try to use that to his advantage once again on Saturday. Our Pace Projector places him on a clear lead after the opening half-mile. To us, if he wins Saturday, he will do it in wire-to-wire fashion. If he can see out the 12 furlongs, the Crown is his. But that is a pretty big "if." At the time he will be completing 1 1/4 miles on Saturday, he will just be turning into that long Belmont stretch, and that is where all of the work he has done to make it this far may start catching up to him--where this fifth race, the longest one of all, over the last 12 weeks, may start to wear on him. We will not be displeased to see a Triple Crown winner return to the winner's circle after Race #11 on Saturday, but his edge is not nearly as great as his odds will indicate, and we are betting against him. #6 is Frosted (5/1). One of the two we view as having the best chance to defeat American Pharoah, Frosted had subtle trouble in the Derby when carried in badly at the start, which left him out of position at the back of the field early. From there he raced wide every step of the way, and covered more ground than any other horse in the race. He has been brought along expertly by Kiaran McLaughlin, and since undergoing a minor procedure to clear up a breathing issue following the Fountain of Youth, he has run the two best races of his life (TFUS Speed Figures of 114 and 122). He is a horse who can race in closer order than he was able to in Kentucky, and he may be in the perfect spot should Materiality be the one to go after American Pharoah early. If Frosted proves capable of stringing together the three best races of his life, it could well be he who denies American Pharoah the Triple Crown. #7 is Keen Ice (20/1). If it is just a matter of finding the best closer in a race that could well fall apart late, then this is your guy. Keen Ice was pretty uninspiring during the run up to the Kentucky Derby, picking up enough points to get to that race while never running anything resembling a race that would make him competitive once he got there. Then, once he got there, he managed to run the best race of his career, and do it through plenty of trouble. This year's Derby was about as clean an affair as you're likely to find for a field of 18, but what trouble there was in the race managed to mostly find Keen Ice and Materiality, whom we will get to. Angled directly down to the rail at the back of the field, Keen Ice saved ground throughout the opening stages of the Derby while far back in the field. He was making what appeared to be a strong run through the second turn when the trouble started. Looking to carry his run in-out to the stretch, he was blocked and unable to get out into the clear to continue on. Hemmed in all through the upper stretch, he finally had to bull his way out at the 1/8-pole, and he still managed to finish well from there. He has no early speed, so he will be looking for some kind of racing to be going on in front of him, which will then allow him to put his race-best Late Pace Rating of 117 to work. #8 is Materiality (6/1). Materiality has the look of a major talent, and he has done things so far during his short career that only truly good horses can do. After winning his debut sprinting in the slop, he stretched out a full 3 furlongs for his second start, while stepping into stakes company, and won easily, with a figure of 101. His next start would come in the Grade 1 Florida Derby vs. a seasoned and accomplished race horse in Upstart. Materiality took the race to his more experienced rival from the opening bell, and dueled him down through the stretch en route to a figure of 117. Materiality was an unlucky horse in the Derby after getting away slowly from the gate and taking a terrible shuffle out of contention through the second turn. That he was able to rally after encountering that trouble is a testament not only to his ability, but to his toughness. He is drawn outside of American Pharoah on Saturday, and he figures to be locked onto that rival right from the start. To us, he is the most likely horse to be on a par, eventually, with American Pharoah's natural ability. Whether he can get there on Saturday is a major story line to this race, since he seems to be the horse in the position of having to keep the favorite honest on the front end. If he is up for that challenge, we will have a horse race on our hands. If he isn't, we may be witnessing history at Belmont Park. We are excited to have a chance to witness another run for the Triple Crown on Saturday. There will be only joy from these quarters should American Pharoah find a way to become the first horse to wear that crown since Affirmed in 1978. But we are betting against it happening. We could go to either of Frosted or Materiality for our top pick, but Frosted had the more subtle trouble in Kentucky, which may lead to him being the better price. We are making Frosted the pick to upset American Pharoah in the Belmont Stakes. Find out EXCLUSIVELY in the TimeformUS Belmont Stakes Package, where our New York Analyst, Mike Beer, will lay out the exact tickets he will play as he goes after historic scores on this historic weekend.